The five year period following the closure of the Thames Tunnel works was littered with disappointments for Brunel. Of the schemes he attempted, many were delayed or abandoned before they began. He travelled the country with great energy, not to say restlessness, investigating various projects with a lively curiosity that was often spiced with impatience at those less bold or imaginative than he. He applied for the job of engineer on Britain's first coast-to-coast railway, the Newcastle & Carlisle, in January 1830 (he was rejected), designed and built a mechanised observatory in Kensington, completed in May 1831 (there were disputes over payment as he had over-run the budget) and produced ambitious plans for new docks at Monkwearmouth, Sunderland, following his appointment there in November 1831 (his designs were rejected at the time). And in 1833, he finally abandoned a decade-long private project to develop an engine  he called it a "gaz" engine  powered by gas pressure as an alternative to steam. They were horribly frustrating times  Brunel writes eloquently of his dejection in his diary  but they contained the seeds of opportunity. It was during this period that the young engineer met his future wife, rode his first steam train and forged a long-lasting association with the city of Bristol, where he was soon to gain the first important foothold of his career. Brunel had been sent to Clifton in June 1828 during his long convalesence from injuries sustained in the collapse of the Thames Tunnel works, because in Brighton, where he had been recuperating, he suffered a major relapse caused by what his biographers refer to as "exertions with actresses". Characteristically, the young engineer was quite as inspired by the Avon Gorge as by the ladies of Brighton. He produced four designs for a suspension bridge spanning from cliff to cliff, which he submitted for competition in 1829. His slightly altered design finally won a second competition in 1830. Although Clifton Suspension Bridge was not, in the end, completed until after Brunel's death, his links with the city were established  most particularly, through a local friend called Nicholas Roch. 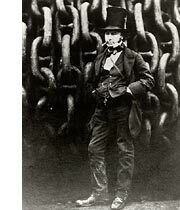 In 1832, after the bridgeworks had had to be abandoned, Roch recommended Brunel to the Bristol Dock Committee, which commissioned him to work on improvements to Bristol City Docks. And a year later, it was Roch who put Brunel's name forward to the Bristol Corporation as a possible surveyor for their new venture: a Bristol to London railway. Brunel had made his first journey by steam locomotive on 5 December 1831, on the Liverpool & Manchester Railway. As usual, he was more impressed by the possibility for improvement than by what had already been achieved. In his notebook he wrote, next to some quavery drawings, "I record this specimen of the shaking on Manchester railway. The time is not far off when we shall be able to take our coffee and write while going noiselessly and smoothly at 45 miles per hour  let me try."